For today's installment, I'm honored to present a guest post by Jeff "Owl" Jones, an angler, blogger, and a guy that you've certainly run across in one form or another if you've ever done any reading about fly fishing on the internet. While I enjoy tenkara, I also realize this Japanese form of fly fishing might not be everyone's cup of tea. With every point of view, there's usually an opposite, and I have no problem with someone "knocking" tenkara as long as they've at least given it a try. Owl took the plunge headfirst, so I have no issue sharing his slant with you today...even if it isn't exactly what you might expect to find in this space. Please enjoy! I first read about tenkara on this blog, back in early 2011. It sounded like alot of fun, and honestly to get right to the point it really was alot of fun. That is, when I wasn't untangling the line that constantly tried to "telephone" up on me or fighting the wind or worried I was going to break the tip on a fish bigger than 12 inches. When I got it, everyone said it wouldn't handle big fish. After all, you're using nothing larger than 6X tippet to protect the rod tip. 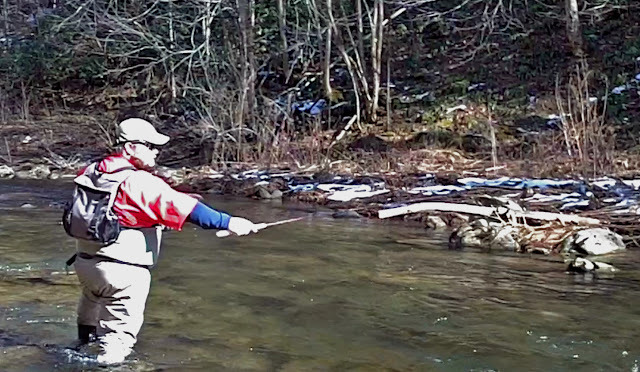 Now, just the other day a video emerged of a guy catching a 20 inch brown on a tenkara rod. A 14 foot rod I think? At any rate, it's clear that the worry I had about breaking off the rod tip was unwarrented. So that leaves the telephone line and the wind. Look, here's the down-lo as far as I'm concerned: If you can find a place to use it, it's awesome. If you try to use it everywhere, you're going to be really, really disappointed. It's a one river rod. Well, not a particular river.....it's a one type of river rod. On the perfect day, without wind or trees or hanging on rocks every other cast, it's more than enough rod to handle whatever fish you want to throw at it. As long as you're not chasing 20 pound catifsh, I suppose. For me though, it wasn't all bad - the tenkara rod was sort of my ticket back into flyfishing. I never really stopped fishing, but I had a bad, bad year in 2010 which included a death in the family and the loss of my job in e-commerce - which I really liked, by the way. I really didn't have much interest in fishing or anything else. But then, when I ran across this new fly fishing thing - this thing that was, by all accounts (where I was reading about it) nearly "magical" I decided that I'd order one and learn a new tactic, a new art. 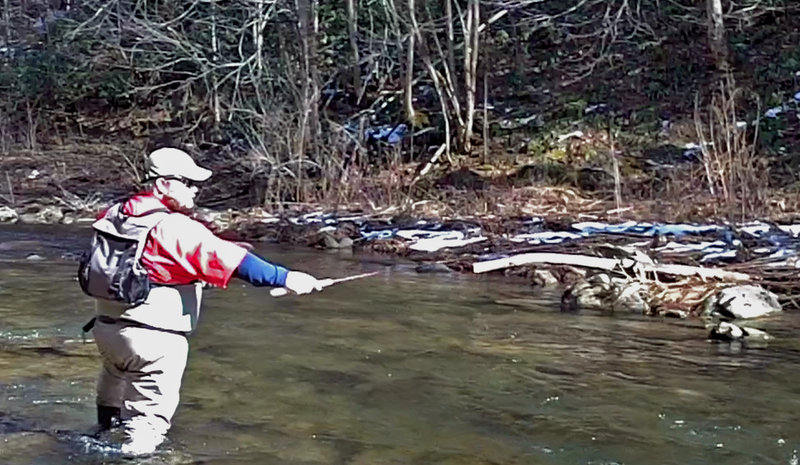 Turns out it's not really an art form (nor is it magical, btw) as much as it is a fly rod with a very short line. It works, but it works like a western fly rod works when you don't use the reel, except.........the painful truth about the whole thing is that I can still do something with a western rod that no one could ever do with a tenkara rod. What's that? Hit a far-bank riffle 40 feet away with a wiggle cast that puts the fly on the fish without me spooking him by having to get 20 feet from him before I cast. That's what. Now, the tenkara faithful will then just come back with "well, it isn't designed to do that. It's a special way of fishing." And I'd have to agree with them. Which is why I'll be sticking to my western rods that can fish close like a tenkara, and far away like a western fly set up. Sorry tenkara, you're fun...but you're just too high maintenence for me. Owl Jones is an incredibly handsome fly fishing writer and the author of several fictional books, including How to Land Large Chub on the Long Line, Fish Aren't Friends They're Food!, and That's not my Fishing Pole, Honey. Owl Jones hopes to someday fish the small creeks and streams of the Catskills, and to travel to Montana and Wyoming again - this time catching an absurd amount of trout - like eight or even... nine. He resides in Georgia where he can, on a good day, see the foothills of the Southern Blue Ridge. He got his start online in the trout fishing community of NGTO, where he eventually became the only member to be banned from the organization twice. If they ever figure out his current username, he's pretty sure he can extend that record. Oh, oh wait....my mistake...a "1.o"
Sorry if my opinion of the modern-day old fashioned cane pole technique didn't make you all tingly, whoever you are. What the *$&# good is just another post about how magical it is (it's not.) anyway? Excuse me for not following in freaking lock-step with the current fad.